Solar is the cooperative trio of pianist Eli Yamin, bassist Adam Bernstein and drummer/saxophonist/percussionist Andy Demos. They explore an expansive galaxy of modern jazz reflecting the myriad musical influences of its members. “Solar is one of those rare ensembles that brings genuine fervor and kinetic energy – the kind usually associated with the best rock – to modern jazz,” wrote George Kanzler in the Newark Star Ledger. The band’s debut release, Suns of Cosmic Consciousness, mixes the music of Thelonious Monk, Charles Mingus, Sun Ra and its own members with the exciting rhythms of Africa, Brazil, Cuba and India in a stimulating melange that radiates with a powerful originality. The album was co-produced with longtime friend and collaborator Marty Beller, drummer for They Might Be Giants. Solar has been together, exploring and expanding the jazz tradition in its own innovative way, for fifteen years. They begin their musical relationship at Rutgers University in 1988 where they were ever present on the New Brunswick scene. The weekly engagements at the Court Tavern and the Old Bay and later at Deanna’s in NYC were always packed and the music was electric, experimental and unpredictable – but always accessible. Solar regularly explores the traditional jazz canon but has also easily incorporated Shakespearean theatre, political poetry and modern dance. Many special guests have sat in with Solar over the years including Perry Robinson, Dave Douglas, Walter Perkins, Noel Scott (Sun Ra), Deanna Kirk, Frank Lacy, Ravi Best, Greg Wall, Mark Whitecage and many others. Solar has been based in NYC in recent years playing premiere jazz clubs including Sweet Rhythm and Cornelia Street Cafe. Twice Solar was the opening act for Sun Ra. 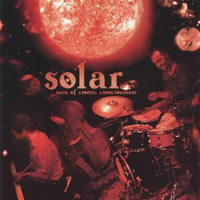 In 2005, Solar teamed up with award-winning baritone saxophonist Claire Daly for her CD, Heaven Help Us All. Solar plays jazz that is accessible without compromises. The group invites you to enjoy all that is precious about life and music. These musicians play their brand of explosive, intuitive and passionate jazz. In a world where long-term musical relationships are hard to develop, Solar takes pride both in their longevity and musical friendship. Their commitment to communication between the players and the audience reaches out to listeners both inside and outside of the jazz world, providing positive energy in today’s challenging times. Suns of Cosmic Consciousness shows that the music of Solar is truly the jazz of now. And the future.